Gorgeous tile around the fireplace! First Floor, 12 steps down. Non-Smoking. Queen size bed in the master, queen size bed in the second bedroom, two twins in the third bedroom and a queen sofa sleeper in the living room. 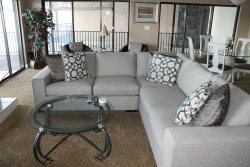 Includes microwave, dishwasher, washer/dryer, fireplace, TV/ VCR/Cable, stereo and a gas grill on the lakeside balcony.